The eyes are the gateway to the soul. They are also one of the first spots to show signs of aging. Thanks to the cosmetic procedure known as blepharoplasty , or eyelid surgery, there is a way to keep the advancing years at bay. Because the eyes are one of the central focal points of our face, tired eyes can make the entire face seem years older than it may actually be. During an eyelid surgery, the extra skin and muscle, associated with drooping, tired looking eyes, is removed and the area is tightened to help restore a youthful, more rested looking appearance. 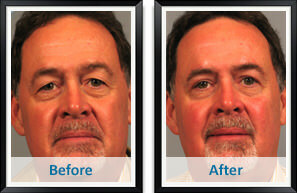 Eyelid surgery is one of the most popular facial rejuvenation procedures for eye bags, particularly among men. To perform an eyelid surgery, small incisions are made within the natural lines of the upper and lower eyelids. The incision used for operation on the lower eyelid can often be hidden within the eyelid itself to avoid any visible scarring. Any extra skin or excessive, bulging fat is removed from these areas and the skin is lifted. By making corrections to older looking eyes, the entire face receives a boost. Eyelid surgery is an excellent procedure to have done in conjunction with other facial rejuvenation procedures, such as a brow or face lift.